My PumpEase Wet Bag full of diapers, wipes & a change of clothes. You might have heard of the PumpEase hands-free pumping bra before--it's a bandeau that holds your breast pump on for hands-free pumping. I recently bought one & it's made my life a whole lot easier, I can tell you. Snugabell, the company that makes PumpEase, also has a number of other handy products & they sent me a wet bag to try out. 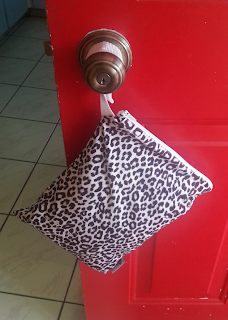 I've had a Bummis wet bag for cloth diapers for three years now--they're great to have one or two around. 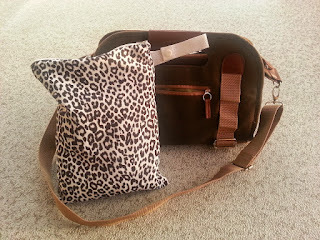 I'd never thought of getting a wet bag specifically for my breast pump before. The PumpEase Wet Bag is a 9" x 11" cloth zippered pouch with a snap open loop at one end. The outside fabric comes in six different fun prints & the inside is lined with waterproof PUL. 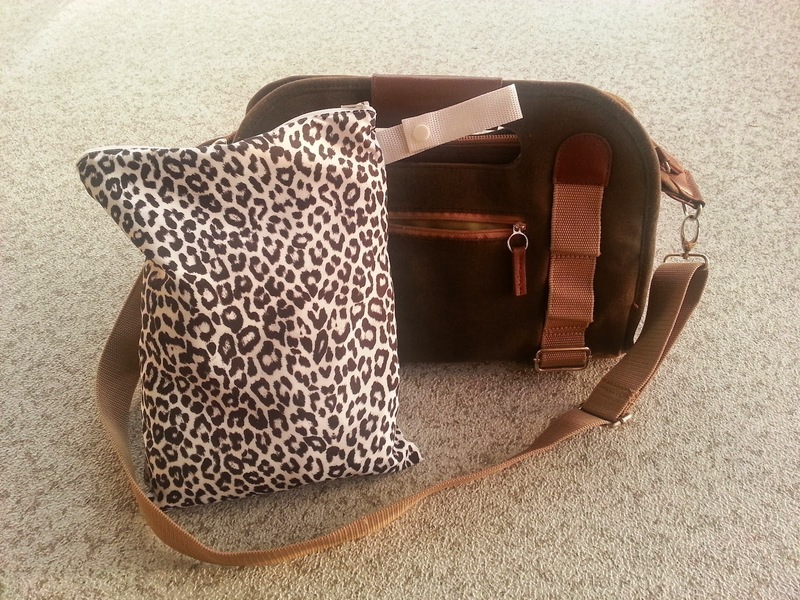 It's designed to hold breast pump parts for when you're pumping at work or travelling. But being a simple waterproof bag, there are many other uses for it too, including holding snacks, cosmetics, electronics, soiled cloth diapers, clothes when potty training, or wet swimsuits. The handy snap loop will hang pretty much anywhere. I love the prints that the wet bags are offered in--I got mine in snow leopard print to match my pumping bra. The snap open loop handle is a great feature as well, because you can attach it to virtually anything--the outside of a purse strap, your stroller handle, a hook on a wall in a public washroom... The PumpEase Wet Bag is easy to clean too--just machine wash it in warm water, no bleach & hang to dry. Even if you're not pumping, you probably could use one of these wet bags. In fact, even if you have no children, you'd find one handy. You can buy them online at www.snugabell.ca, for $14. Follow Snugabell on Pinterest, Facebook, Twitter & read their blog for breastfeeding resources & lots more. Disclaimer: This was not a sponsored post, however, I did receive a free wet bag to review. I am also an Amazon.ca affiliate & the first link is an affiliate link, so I'll receive a small commission if you buy a Pumpease bra via my link. What a good idea! I never even thought to put the pump into a wet bag- I used a tupperware box to tote it around- this would have been so much more compact!